Someone named “B. Melon” asked that question on the “Strange but True” segment of the Web site, readthehook.com. To answer the bee question, Bill Sones and Rich Sones did what many do. They asked UC Davis apiculturist Eric Mussen, a Cooperative Extension specialist and UC Davis faculty member for the past 32 years. 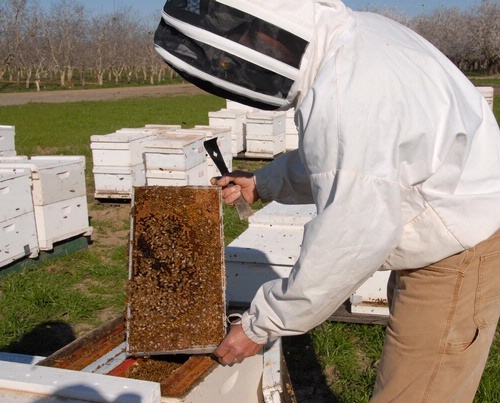 A single Africanized honeybee releases no more venom than other bees but does react more vigorously to the "alarm pheromone" released, staying agitated longer, says University of California-Davis entomologist Eric Mussen. So instead of a dozen frenzied bees pursuing a victim for 100 yards, thousands from the colony of 30,000 may pursue, some up to a quarter mile. Yikes. Even a world class sprinter couldn't outrun them at 20+ miles per hour, though fortunately most of the bees won't pursue very far. But one University of Miami grad student on a field trip to Costa Rica reportedly stepped on a colony in a cave crack, caught his foot, and died of 2,000 stings. With Africanized bees, it’s this scenario: Guy out for a walk, bees attack him, guy moves fast, bees move faster, guy in serious condition. Guy says he never thought the swarm of bees would follow him that long. Or that there would be that many. Which reminds me of the email I received about 10 years ago about two hunters walking through the woods when they encounter a bear. One hunger unlaces his boots and slides on a pair of running shoes. But back to Eric Mussen and Africanized bees. Mussen served as the content advisor for a children's book, Africanized Honey Bees by Barbara A. Somervill, published this year by Cherry Lake Publishing, Ann Arbor, Mich. The book starts out: "In Copperas Cove, Texas, a couple is recovering from stings from hundreds of bees. Doctors stopped counting stings on the woman after they reached 500. Her husband has more than 100 stings--on each arm. Both had bees in their mouths and all over their faces. They were just getting into their car when they got the first stings. Neaby was a hollow tree that served as the bees' nest." The bees, Somervill continues, were Africanized bees, an invasive species that breeds with our honey bees. It's an interesting book. The cover features an image of an Africanized bee (which looks about like any other bee). Fact is, the only way you can tell an Africanized bee from the common European or Western honey bee is through a microscope.